When I'm not having fun writing a few articles for Howtoi, my regular day job involves using PowerPoint a lot. 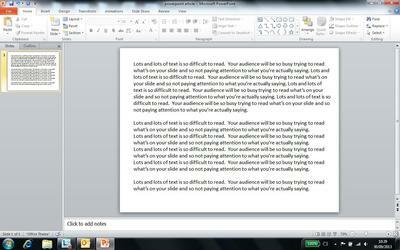 I'm either preparing a presentation, delivering it or on the receiving end. 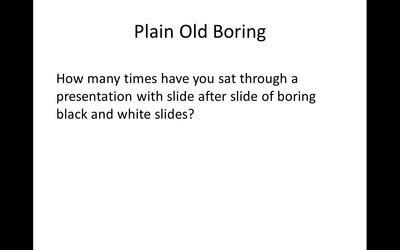 I've been using PowerPoint for over 13 years and in that time have seen some fantastic and memorable presentations. I've also seen some terrible ones, memorable too but for all the wrong reasons. The key to a great PowerPoint presentation is to remember it's only an aid to your presentation. Think about what your message is and the purpose of your presentation first and then build your slides to support this. It's not about writing out a speech onto slides. 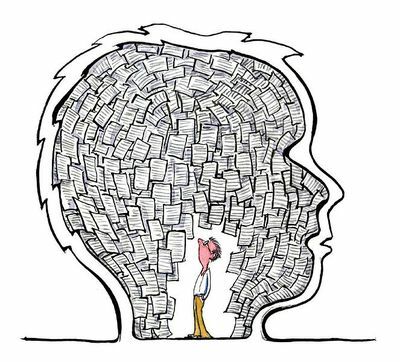 If you're presenting then you want your audience to pay attention to what you're saying and not switch off while attempting to read dense blocks of writing. Consider what the key points are that you want to get across and present them as simple bullet points. There's two ways that people often go wrong with the look of the PowerPoint slides. It either looks very basic with just black on white or they try to get too fancy and it's impossible to read and can look very out dated. Consider creating a simple template that you use consistently on all slides. Some ideas include choosing one colour, keep a separate section for the title and if you have a company logo you could add this too. Keep the font easy to read and don't play around with overly cursive script. 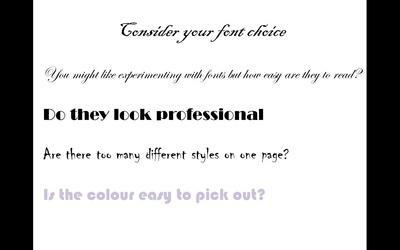 Once you have your chosen font, stick with it rather than introducing several different types. Also consider the size, too small and it can't be read, too large and it just looks a little silly. Text contrast is important too. If the colours are too similar it's hard for the audience to read. White or light colours on a dark background or vise versa work best. 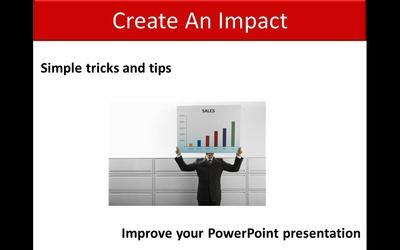 PowerPoint has some in built tools that allow you to animate text and images. If you're using this function, the simpler the better so just make it appear. Having things flying around the screen doesn't look very professional. Make sure you practise your presentation in advance so you know when a build is about to happen. That way you will appear seamless and in control. As they say, a picture says a thousand words. Using photographs and images can be engaging and get your point across better than alot of text. 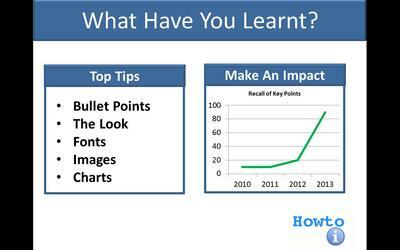 If you have a lot of data to present, you can use the charts feature in PowerPoint or paste over from Excel. Keep the charts as simple as possible and voice over or annotate any extra detail you want to convey. Good luck with your next presentation, I hope it goes well.